Looking for that perfect gift for the leaders in your school or district? Not sure what to get that principal or superintendent that has everything? 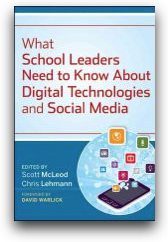 Get them What School Leaders Need to Know About Digital Technologies and Social Media (or, if you prefer, the Kindle edition). This collection of short, to-the-point chapters about a variety of educational technologies is an excellent read for those school leaders who understand that technology is an increasingly important component of teaching and learning, but who aren't very comfortable themselves with technology. This wouldn't be a good gift for folks who are immersed in this environment, but for school leaders that want to learn but don't know where to start, this is a great choice. Hi! My name is Lauren McKenzie and I am an EDM 310 student. I was assigned to your blog for one of our assignments. Although I am sure many would consider this post as a "housekeeping post" I am really glad I saw it! At the beginning of EDM 310 I thought I knew a lot about technology, and then I became intimidated and realized there was so much more to learn! This book sounds like a great gift for a lot of people! I would have loved to have a tool like this at certain times during this semester! Mr. Fisch- I like how your addressing the problems with new technologies because i myself am not good with very many new technologies. I am glad you showed this book to me and many other because i might look into this. This relates to me because all this new technology in the classrooms sometimes confuse me or just don't work for me. I think new technology is great but now teachers really heavily on computers and projectors for class. If a teachers computer breaks in the middle of class some teachers wont know what to do. Monday in my English class in the middle of watching star wars the projector broke, but thankfully we had other activities to do. This relates to education because all over the world new technologies are being put into classrooms and its really affecting education and learning. The problem with this is that most people are not good at using things like smart boards or projectors, even just a normal computer. This book could help people all over the world with technology issues. Also if you want to be a leader you do need to know how to solve problems with these new technologies. In my classes there are always a few kids who know how to work and fix problems when teachers don't. Most students know more about computers then their parents do. Overall this was a great article about technology problems. I can see this being used for helping school leaders gain the knowledge they need to help their schools enhance learning. I can also see this used to help school leaders gain a deeper understanding of the ends and outs of social media. Understanding these sites we well as the students do is necessary to take on cyber bullying.